Dia Active Box is an activewear styling service that caters to women plus sizes 14 and up. Upon enrolling with Dia Active Box, I filled out an extensive survey asking me about my clothing size/weight/height, style, price range, and what activities and/or sports I partake in. For $20 a Dia Active Box stylist selects five curated pieces sent directly to me! I am able to try them on at the convenience of my own home and only pay for pieces I decide to keep! The $20 styling fee is applied to whatever I do keep, but if I keep the entire box 25% is taken off as well! 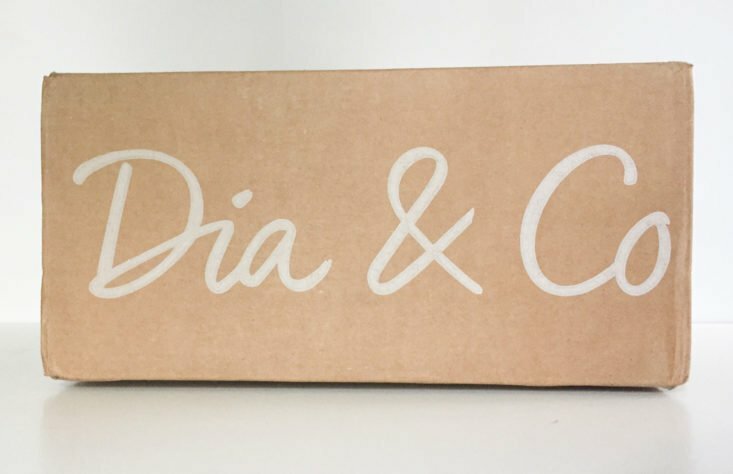 The items in my box are chosen personally for me dependent and reflective of my style and price preference, so the package you receive from Dia Active Box may be entirely different than mine! About Dia Active Box by Dia & Co. The Products: 5 plus-size activewear pieces selected for you based on your Style Profile. Good to Know: Dia Active Box offers free and unlimited size exchanges! You can exchange pieces for a different size at no charge! This note from my stylist (Monique) was included. I like the idea of having cheerleaders in any aspect of my life, so this is much appreciated! Also included was this invoice that has a detailed list of the brand, name, color, and price of each item she selected for me. This box was complimentary, so the prices all say zero, but I have the retail prices provided by Dia listed below alongside each item. For the typical subscriber, there would be a calculation here showing the grand total, followed by the total cost to keep all five items. The price would reflect the $20 styling fee deduction and the 25% discount. Instead, I have calculated it all below in the wrap-up! First of all, I really like the cut of this top. It’s a good look for me and for most women who are carrying extra weight in the midsection in that it flares out below the bust line. I also like that the sleeves have a vertical section on the underside that seems to be made of a higher natural fiber content and is moisture wicking – that always comes in handy during a workout. On the other hand, I am not crazy about the color or the neckline, I feel like both are unflattering on me. It also feels like a whole lot of spandex. I think this top would look amazing on someone with darker skin and a longer neck. I would probably send this top back. I LOVE these leggings! These are actually my favorite piece in the box! When I pulled them out, they looked tiny, and I thought, oh no, they are either going to be too tight or sheer, but neither is true! They are actually flattering, comfortable, and completely opaque. I also love them because they are soft and have a high natural fiber content. They feel like a super soft and stretchy cotton knit, and I love that! This top is a very lightweight synthetic blend, and it’s slightly sheer. It’s a bit small on me, or maybe the cut is just wrong, but in either case, it’s not working. I love a solid black tee, but this one also has a bad sleeve length (cap) for me and makes my shoulders look completely round. It’s just not a good look for me, unfortunately. I will send these back. I have mixed feelings about these leggings. They fit really well and are made a of a durable synthetic blend. They feel really solid and well made! They don’t have a ton of compression, but they have enough. I also think they are flattering on my calves. Unfortunately, my thighs look awful, and I don’t feel like I’m really in a place to have red thighs right now anyway. I would probably end up sending these back. I really like this sports bra! The main thing I look for in a sports bra is comfort and support, and this bra delivers on both! The girls are definitely locked and loaded, so to speak, but I don’t feel like the back or straps are digging in at all. I also love the design on this piece. It has small perforations throughout, and the straps on the back are super cool! I love it! Verdict: This was my first ever box from Dia Active Box, and while it was not a slam dunk, first boxes rarely are. It was still loads of fun trying everything on, and I think my stylist did a good job sending over quality pieces for me to consider. I absolutely love my new grey leggings and sports bra! They are both really awesome pieces that I know I will get a lot of use out of. Another cool feature of Dia, for both the style and active boxes, is that you get to rate your items when you check out. So as time goes on, your stylist begins to learn more about the kinds of things you like, and the fit with your personal style gets better over time. I actually can’t wait for my next Dia Active box! Can you still get this box if you sign up today? Dia Active Box curates its boxes based on each individual’s preferences as well as what’s available. What you get might not be the same as what I got, but you also might get something that fits your style and body even better than the looks above! Sign up and see what they choose for you! Value Breakdown: This Dia Active Box has a $20 styling fee and includes free shipping and returns. The total retail value of the items inside is $314.95. The cost of each item is listed alongside it above, but if I choose to keep at least 5 items, I get a 25% discount. The $20.00 styling fee for the box would also be applied to the purchase, meaning I’d end up spending $216.21 for the whole box. That’s a discount of about 31%. That’s a great deal! What do you think about Dia Active Box? That sports bra looks very flattering. Love the back design. Hi Toni Marie! No, this box is like Stitch Fix, where you get 5 items to try and then you try them on and buy what you want / send back what you don’t want. Hope this helps! I love the back design on the sports bra and that it has a long length in the front. It makes it much more flattering and actually looks like one that I wouldn’t might showing off during a workout. Great first box…thanks for the review!